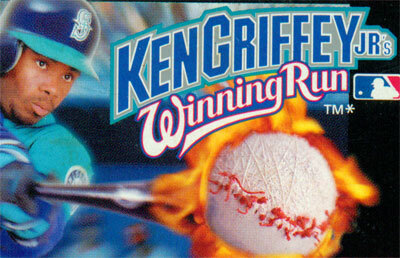 Ken Griffey Jr.'s Winning Run is a licensed arcade baseball game featuring MLB's own Ken Griffey Jr. Released in 1996, it contains all 28 MLB teams and logos from that time, with rosters containing fictitious names for the players (Ken Griffey Jr being the only real player in the game). Next to exhibition games, there are different game modes to compete in. In the MLB Challenge, players start with a weak team and go against every major MLB club to go up the rankings. There is also a complete World Series, All-Star games and the MLB League. In the league modes up to eight players can choose a team and play a season of 26, 52 or 162 games. Between matches players can change the line-up and rotation, and trade away players. Gameplay is fairly tradition, with fielding, pitching, batting and baserunning. Next to fastball and curveballs, there are six different pitches such as Super Fast, Screwball, Super Curve, Slider, Change Up and Knuckleball.